Now that the 3 weaners have been here a few weeks it seemed a good time to take stock of their progress so far. 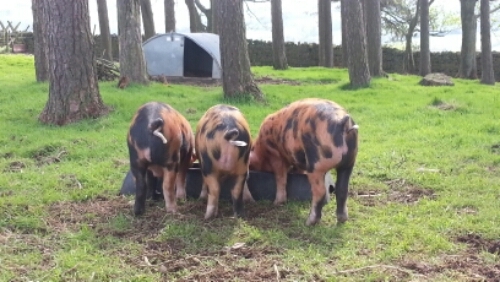 For the first couple of days they weren’t too keen on eating the pig feed that was provided which was a bit worrying. However my suspicion is that after living in a stone barn for the last few weeks their new home in the woods was far too distracting. The little “tractors” got to work almost immediately they arrived with their noses rooting under the grass and among the various tree roots. They have now adapted well to the new surroundings and are always eager to see the “green bucket of joy” which arrives twice a day. There’s always a rush to the trough but at least there’s enough room so they don’t fight over it! We are lucky that we have been able to get some waste fruit and vegetables from a local shop which can be used to supplement their rations. This helps to reduce the rate at which they will go through the expensive pig feed so the extra work in preparation is worth it in the long run. We must also remember to keep their fruit and veg separate as the regulations insists that pigs cannot be fed anything that has been in a kitchen or in contact with other food stuffs. Unsurprisingly they are very fond of almost any fruit (they don’t get citrus fruit though) but they’ll also happily devour most types of root veg as well. It just needs to be chopped into bite sized pieces but it won’t be long before even that isn’t needed! Now that they are more settled in their woodland home the task of measuring is made much simpler now they are happy to have us around.The fact that these have been named based on their appearance is proving very helpful when checking on them. One thing I’ve noticed is that they are definitely eager to nip any stray fingers or welly boots and they have a very nasty nip. This might be simply because these are the first boys we’ve kept and they’re just a little more boisterous.